This was a tangential subject of discussion during the March Round Table. We’ve added Goldman Sachs price targets and will be monitoring them versus ACE and S&P. Nutshell: Might this be a way to gauge sentiment? In this case, these differentials could deliver influence or impact, providing a potentially meaningful sentiment indicator. As a quick reminder to be careful out there, this is what this morning held for Garmin (GRMN). That’s a reduction from $63 to $54. When they’re not doing “God’s work” or referring to retail investors as Muppets, Goldman Sachs (GS) makes some calls — long and short — that can be influential in the market. In some Wall Street circles, the legions of Goldman Sachs are playfully known as Masters of the Universe. In addition to the two lists shared above, here’s a list of nineteen stocks that Goldman Sachs believes are headed for price swoons — a list of stocks to sell short. and look for stocks that are likely to move on company-specific factors and are less prone to moving with general market and sector trends. Among the overvalued stocks Goldman thinks could drop are Celgene (CELG), OReilly Automotive (ORLY) and Red Hat (RHT). Stocks underweight by mutual funds that could fall are HST, CTL and EQR; and likely to deviate from the broad market and their sectors are KLAC, JEC and COH. Rounding out Goldman’s 19 stock recommendations that could reward short sellers: ARG, DO, DISCA, FLS, KSS, MOS, NDAQ, NVDA, TDC, WU. The subtle deterioration of fundamentals continues unabated and the number of companies considered “materially weaker” outnumber the “materially stronger” entries again this week. This means that the long-term forecasts continue to show more downside pressure. 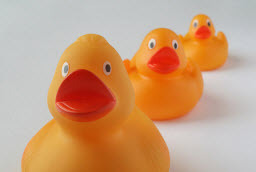 This week includes the shopping (retail) stocks and the sale opportunities continue to be fairly thin and far between. 1 Coach (COH) 3-5 year low price forecast reduced from $75 to $65. The median Value Line low total return forecast (VLLTR) is 4.0%, up slightly from last week’s 3.9%. 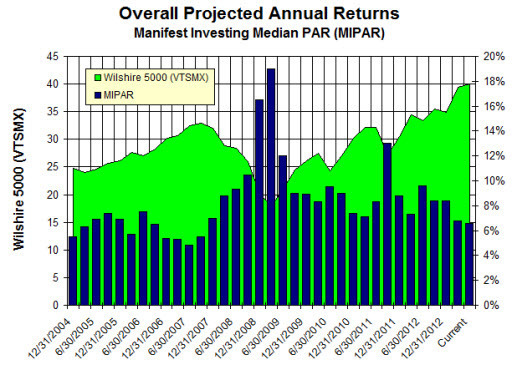 The screening results shown here represent the survivors of a screen based on a projected annual return in the Sweet Spot, an excellent Quality Ranking, leadership financial strength and EPS stability and a dash of Motley Fool CAPS positive sentiment. The median projected annual return (MIPAR) for all 2400+ stocks followed by MANIFEST (Solomon database) is 6.6% (4/30/2013). The multi-decade range for this indicator is 0-20% and an average reading since 1999 is 8.5%. With the median return forecast hovering at 6.6%, less than the historical average and nearing historical lows, it still makes sense to shop amongst the highest quality companies. This month’s Sweet 16 provides a smorgasbord of companies that keep making appearance on a variety of our screening efforts, model portfolios and/or educational webcasts. Techne (TECH) may be among the fundamental analysis leaders but the technical indicators (including sluggish momentum) are weak. The stock was recently dumped (sold) by the Motley Fool’s flagship newsletter, Stock Advisor. Study carefully. The French integrated energy company Total (TOT) has hovered near the top of our screens for a few months. The price-to-fair value ratio at Morningstar is 89% and the PnF sentiment is “bullish” with price pressure of +71%. 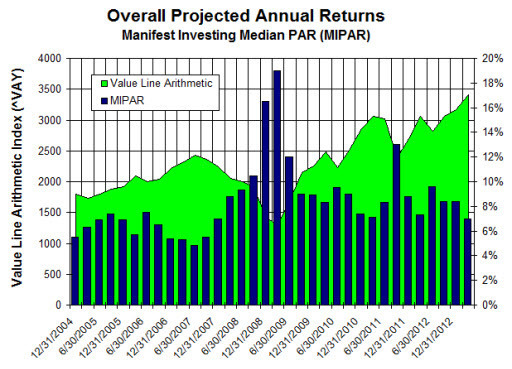 The PAR is 15-16% and the Value Line low total return forecast checks in at 16% also. With a top decile quality ranking and an overall fusion rank of 100, the stock is worth a closer look. I think Varian Medical (VAR) and Masimo (MASI) are probably impacted by the medical device tax debate. They’re both leaders in key areas, targeted radiation therapy (Varian) and non-invasive monitoring (Masimo). The debate is a little like watching a dog chase it’s tail. Call it a tax or surcharge or whatever, it incrementally elevates the cost of health care (bizarre since it’s embedded in an affordable care law) — and patients either pay more or these companies atrophy margins. Coach (COH) continues to fire on all cylinders and the cash register queues refuse to abate. Tomorrow’s Value Line edition update is basically the “Shopping Edition.” It includes a bunch of retailers, apparel and specialty retail companies with a few others. But it’s clearly deluged with those consumer discretionary companies that torment us. To kick things off, for those in rainy day refuge or looking for some stocks to study in advance of the update, here’s some of the stocks we’ll most likely be chewing on over the next few days. All of these stocks have relatively high return forecasts, either good or excellent quality rankings, relative price strength and momentum and in most cases, symptoms of positive (upward) price pressure. Fossil (FOSL) and Nick Stratigos’ Round Table Selection of Rue 21 (RUE) head this list and qualify on all counts. Our 8th most widely-followed stock, Coach (COH) qualifies with the exception that COH still seems to languishing in bearish sentiment — although last week’s positive news probably places that weaker characteristic in jeopardy. A couple of people have requested a quick triple play screen in the last few days, so we’ll take a closer look. Companies of Interest: Recent Round Table selection Vera Bradley (VRA) just toggled back to “Bullish” and with fundamentals intact, the price drop could be a sale vs. distressed merchandise. Kohl’s (KSS) was downgraded by JP Morgan this morning — so study carefully and monitor for impact on long-term trends. Coach (COH) continues to be challenged in a challenging retail environment but the news/expectations out of China have been quite good of late. United Health (UNH) has some of the stronger P/E expansion and margin enhancement potential on the list. Keep in mind that the Triple Play screening criteria is generally most useful in the later stages of a bear market but the concepts are always valid. We begin by limiting the field to companies with Fusion Rankings (a combination of return forecast, quality ranking and technical factors) greater than 80. We then limit the field to companies with (1) projected P/E ratios greater than current P/E ratios and (2) profitability forecasts greater than current profitability levels. P/E expansion and margin enhancement are both annualized in the results table. The qualifying companies are sorted (descending) by MANIFEST Rank. This month features the top percentile of all stocks covered at MANIFEST on the basis of quality (our combination rating of financial strength, earnings stability and relative growth and profitability forecasts). It’s not the customary sixteen stocks or so … but these twelve quality champions are formidable and worthy of a closer look and automatic/perpetual pounce pile status. The median projected annual return (MIPAR) for all 2400+ stocks followed by MANIFEST (Solomon database) is 7.2% (2/28/2013). The multi-decade range for this indicator is 0-20% and an average reading since 1999 is 8.5%. With the median return forecast hovering at 7.2%, less than the historical average and nearing historical lows, it makes sense to shop on the top shelf. If prices continue to surge absent any strengthening of fundamentals, the return forecast could get significantly lower. The subtle whittling of expectations (no slashing) continues as we begin the first quarter updates for 2013. Invest in the best (highest quality) but only when they’re suitably on sale. The top shelf company with the highest fusion rating (combination of fundamental and technical analysis scoring) is Cognizant Technology (CTSH). Cognizant is well-positioned within its industry with a strong track record and stands to benefit as the global recession turns to recovery. Mesa Labs (MLAB) continues to score well and is one of our favorite companies from this year’s batch of promising small companies from Forbes. The recent price swoon in Coach (COH) leaves the company with the lowest price-to-fair value ratio (76%) from Morningstar and Standard & Poor’s (83%) among the companies on the top shelf. The price reduction also generates an annualized low total return forecast of 16.4% at Value Line. There’s a rumor floating that somebody thinks all of the purses are a bit pricey … but those crowds of trampling shoppers and a legacy of results suggests that the whole company might be worth buying. I don’t think the price tag hanging on the company is $40-something. Those return forecasts across the board look pretty good on the top shelf … not a bad idea to start there.